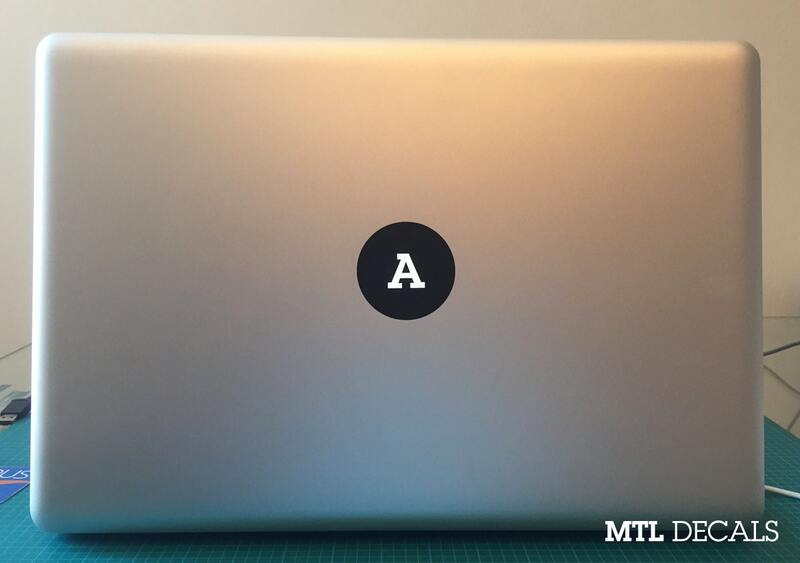 Make your macbook stand out with a custom monogram decal! Covers apple logo perfectly. Fits all Macbooks, Macbook Pros, Macbook Airs (13" 15" 17"). Comes with small test decal and instructions. Leaves no residue if removed. Haven't applied it yet, but I am looking forward to it. It's everything ! ! ! I accept credit card payments through Etsy's Direct Checkout and Paypal. Let me know if you have questions before ordering. Because vinyl decals cannot be re-used, returns are not accepted. If for any reason your item is damaged in the mail, please contact me asap! If 3 weeks has gone by and you have still not received your decal, please contact to discuss replacement. Refunds or replacements are handled on a case by case basis. 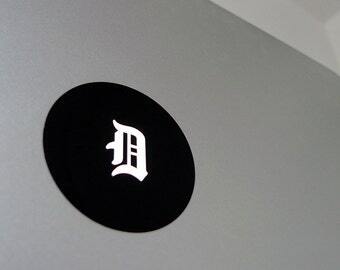 All decals are made to order and shipped from Montreal, QC. Macbook decals ship within 1-2 business days. Wall decals ship within 3-5 business days. Canadian wall decal orders are shipped using Canada Post or Chit Chats. Delivery time varies between 2 to 9 business days. If you are looking for an express service, please get in touch before placing your order. US wall decal orders are shipped via USPS. Delivery time varies between 3 and 5 business days. International wall decal orders are shipped via Canada Post. Delivery time varies between 6 and 10 business days. Please keep in mind that this time frame is not guaranteed and does not include delays in customs. *These time frames do not take into account hold ups in CUSTOMS and weather issues. Wall decals shipped to Italy can take anywhere from 4-6 weeks to arrive. Please make sure correct shipping address is entered at checkout. Once your decal has shipped, there is no way to re-direct package. If incorrect shipping address is provided, buyer is responsible for re-shipping fee. Items are shipped to Etsy mailing address by default unless specified. In a rush? Faster shipping is available for an extra fee. Buyer is responsible for any and all taxes or customs fees that may be charged when item arrives to destination. Will the decal damage my wall if ever I want to remove it? All our decals can be removed easily without causing any harm to your walls thanks to a gentle water based adhesive! YES :) Simply click the "Request Custom Order" button on your left hand side to get in touch! Will there be a transparent box around my decal? Do you offer discounts if I order more than one wall decal? We do offer discounts on large orders. Is there any special prepping before installing my wall decal? If your wall has recently been painted, it's recommended to allow 2 weeks for the paint to cure before installation. Extra precaution should be used when applying wall decals to "Low VOC" or "Zero VOC" paints as these paints may exhibit lower adhesion levels.